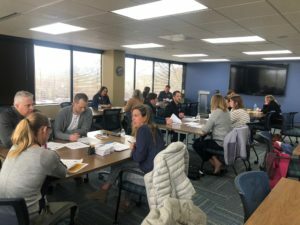 The Waukesha County Business Alliance, Inc. has expanded its Schools2Skills™ program to educate high school and middle school students on careers in health care. The first Schools2Skills Health Care tour took place on Monday, October 29. Forty-five students from Oconomowoc High School, Arrowhead High School and Mukwonago High School visited ProHealth Care’s UW Cancer Center to learn more about careers in nursing, pharmacy, imaging, physical therapy and more. Professionals in those fields talked to students about why they chose their career, what their job duties include and how students can get started in the industry now. Students were able to ask questions of the professionals to learn more about jobs in health care. Schools2Skills started in 2011 to give Waukesha County high schools the opportunity to tour local manufacturers, see firsthand the innovative and advanced technology right here in southeast Wisconsin and learn about what careers are available in the industry. Schools2Skills Manufacturing is dedicated to educating students about what the manufacturing industry has to offer, showing them that a career in manufacturing allows those with highly technical skills to excel and succeed. In seven years, more than 3,000 students, parents and educators have toured more than 100 manufacturers. During the 2018-2019 school year, the Alliance is piloting two Schools2Skills Health Care tours with ProHealth Care, with the goal to expand the program with additional health care providers in the future. The Alliance is also expanding its Schools2Skills Manufacturing tours. Twenty-six tours, a record number of tours in one school year, will be hosted, with specialty focus on areas like food and beverage manufacturing, business and marketing and more. Middle school students are also being given the opportunity to participate in the tour program. Click to read coverage in BizTimes Milwaukee and the Waukesha Freeman.